Feedback is one of the cheapest, most powerful, yet, most under utilised management tools that we have at our disposal. Working without feedback is similar to setting out on an important journey minus a map or signposts. You may have a great sense of direction but this may not be sufficient to keep you on track. Bearing this in mind, representatives of RHAND Credit Union took the opportunity to gain insight into the issues affecting our members in the sister isle of Tobago. 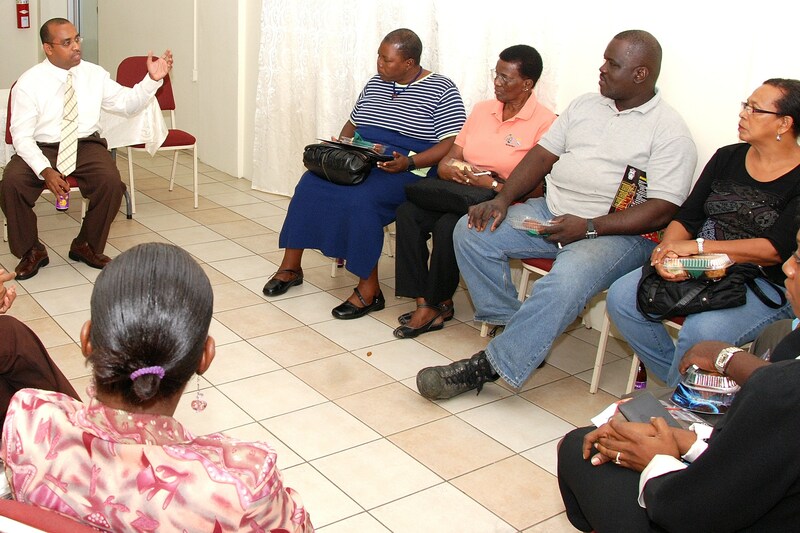 Tobago Branch Manager, Mr. James Baptiste (top left) engaging in conversation with the focus group attendees. We hosted an intimate focus group on the afternoon of January 6th 2011, where members were encouraged to utilize the forum to voice their concerns about current practices at the Credit Union as well as to suggest any potential improvements to its product/service offerings. This simple exercise allowed us to see ourselves in the eyes of YOU, our members…..the owners of RHAND Credit Union! Now we know that our Tobago members would appreciate having a special Christmas function, to celebrate them and their unequivocal support to RHAND. They deserve it after all, don’t they? They are also concerned about the recruitment of new (quality) members to ensure that delinquency is kept at a minimum. It was also indicated that RHAND needs to make itself more visible in the public eye and suggested more emphasis on advertising. These were all equally valuable contributions and only just a few of them! No longer the “silent partner” – we have heard from Tobago and quite frankly, we would like to hear from as many members as possible. So whenever you can, please drop us a line. Who knows? You may even be a part of our next focus group! Members present were: Elson Bobb, Marsha Mc Pherson, Lauretta Roopnarine, Claude Anthony, Kenneth Robinson, Glenderlyn Roberts, Helena Boucher, Desiree Hackett-Murray, Hayden Miller and Selby Cole. RHAND Employees present were: Assistant General Manager – Anne Marie Thompson, Branch Manager – James Baptiste, Credit Officer – Ermyn Clarke and Clerk – Christy Nelson. 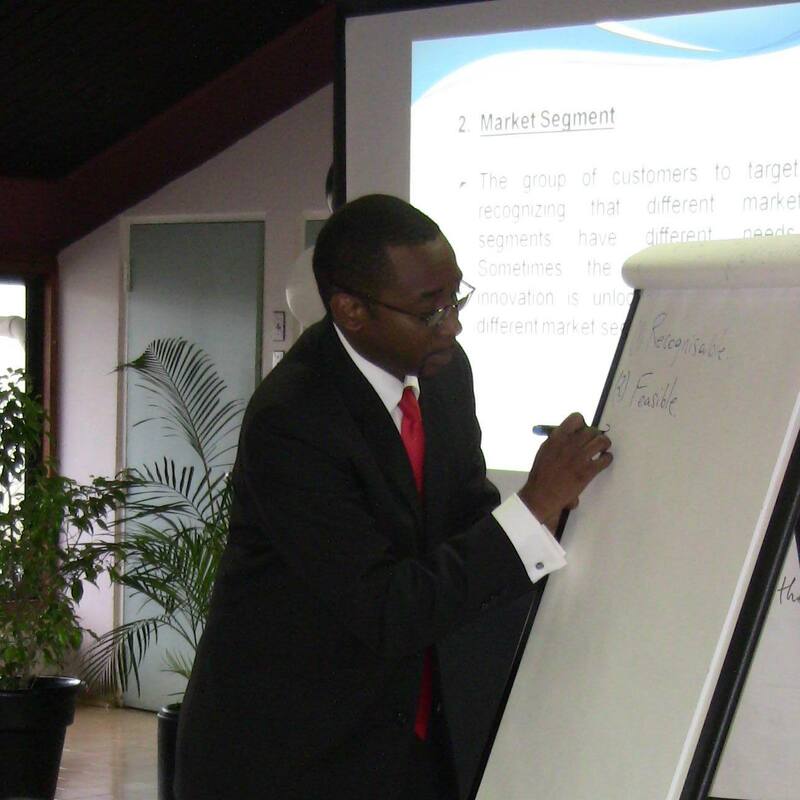 Hayden Blades of Business Insight Limited (BIL) has partnered with RHAND Credit Union, to deliver the RHAND Entrepreneurship Development (RED) programme to members and other interested persons. It has become imperative that we all understand business – both the young and the not so young. Eighty percent (80%) of the world’s wealth is controlled by Businessmen who make up approximately fifteen percent (15%) of the world’s population. With an idea and a few thousand dollars, another big business may be born. We are in the era of entrepreneurship! RED is timely, relevant and keeps with our passion of developing our people’s earning potential. In keeping with the theme of the T&T budget 2010, as well as, RHAND being synonymous with the empowerment of people, we present RED. When RHAND Credit Union Co-operative Society Limited was first established in 1947 a single share was valued at $5.00. Since then RHAND has evolved into the financial institution that we have come to know today. No longer limited to over the counter transactions; members can now make their monthly contributions via salary deductions or standing orders with the Bank. The intention of our co-operative society’s founding members was to encourage thrift through monthly savings. Sixty-three (63) years later, after several economic booms and recessions… is $5.00 per share really enough? Imagine this scenario. You are living in Point Fortin and working in San Fernando. Your Ministry has just finalized your back pay and you can finally take that Car Loan. You are a RHAND member but the Bank is just two blocks away from your office. What would you do? Does RHAND need a branch/office in South Trinidad? On Saturday 20th March 2010 RHAND Credit Union successfully hosted its 62nd Annual General Meeting. The meeting was conducted simultaneously at UWI Sport and Physical Education Centre, St Augustine, Trinidad and Works Conference Centre at Old Government Farm Road, Shaw Park, Tobago via video conferencing. The event was just over six hours long, with over eight hundred members in attendance (684 Trinidad and 138 Tobago). What is your opinion of RHAND’s recently concluded Annual General Meeting? Welcome to RHAND Credit Union’s newly redeveloped corporate website. We have attempted to create a website that allows you – the member to have a better web experience. Take a look, discover what’s new and leave us a comment. The Management team and the members of staff of RHAND Credit Union would also like to take this opportunity to wish all of its valuable members a safe, happy, healthy and prosperous New Year.